Click on the Photo, or Name of the Location, for an enlarged view. 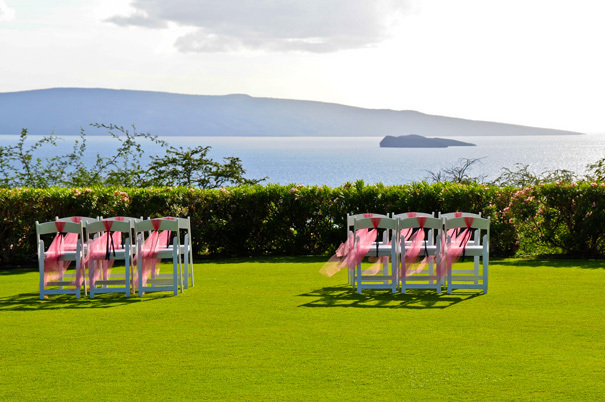 PRIVATE MOLOKINI LOOKOUT (Second Photo) and (Third Photo) located on the Wailea Gold/Emerald Golf Course, this private ocean view lookout is perfect for large groups and private catered receptions. 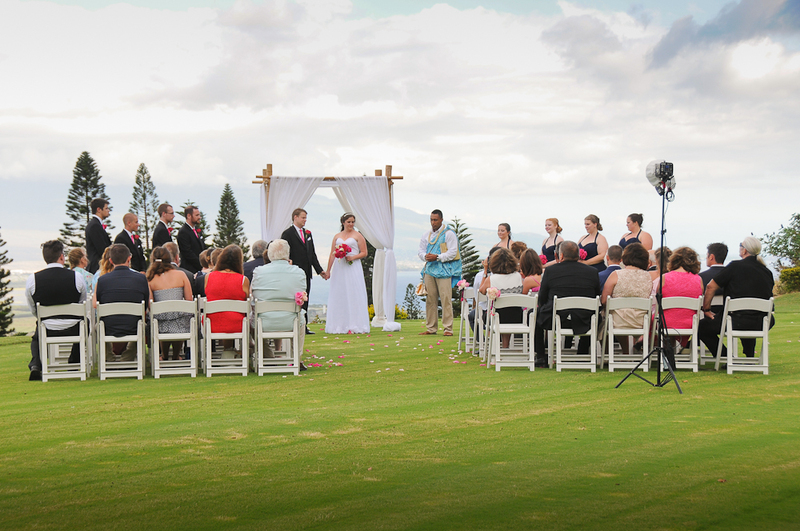 This very private large grassy lookout is an excellent location for sunset weddings or weddings during the day. Since it is maintained by the Gannon Restaurant, your wedding reception can be catered at this location for larger groups, or can take place in one of the intimate dining spots in the restaurant. 20 chairs are included for your guests, additional chairs are available. Site fee when having a reception at the restaurant is $942.00, or, $1068 if you are not having a reception at the restaurant. (Some other restrictions apply). MALUAKA BEACH is located in front of the Makena Beach and Gold Resort in Makena, Maluaka Beach is a beautiful large white sand beach which has restroom facilities. 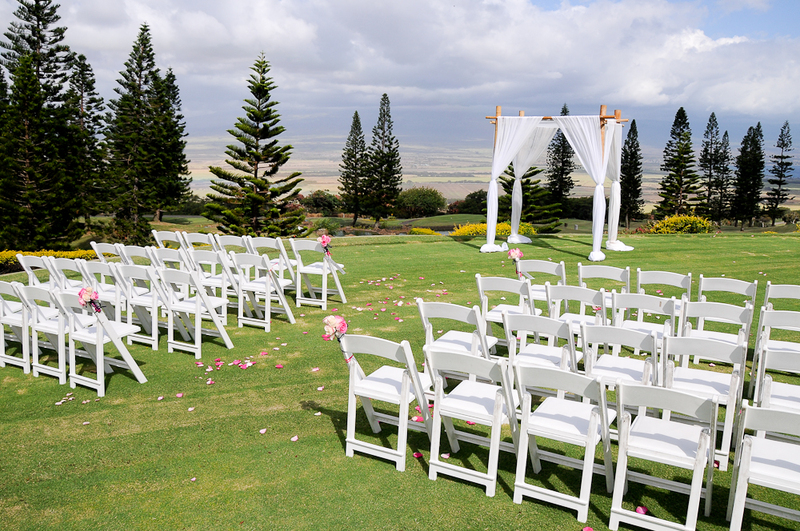 Since this spot is becoming popular for wedding ceremonies, we can not guarantee there will not be other people there. 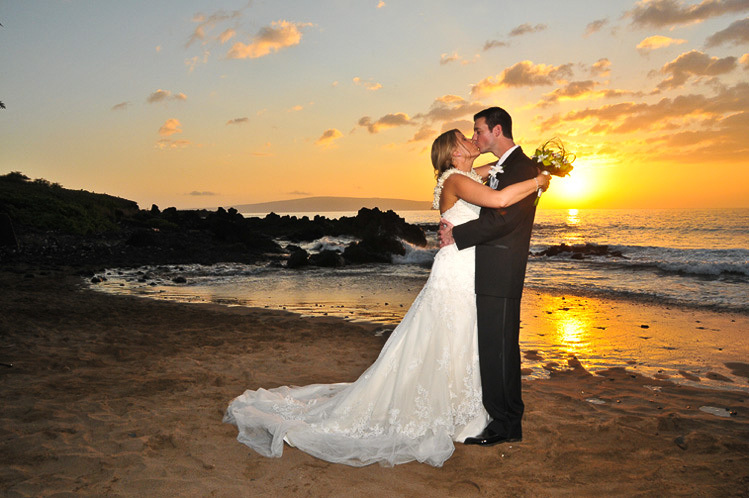 Weddings are performed on the beach with views of Molokini - the sunken crater island, as well as the West Maui mountains and offers great sunsets year round. A permit is required. MAKENA COVE BEACH located past Big Beach in Makena between two residences. 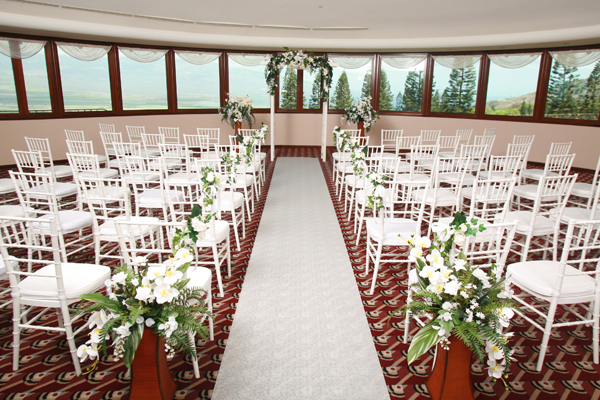 Since this spot is somewhat hard to find, we will lead you there on your wedding day. The smallish white sand beach is bordered by lava rock outcroppings on either side. Sunsets are great from this beach especially in Winter and afford views of Molokini, the sunken crater island. 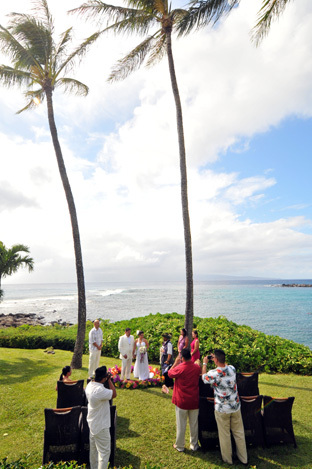 Weddings are performed on the beach or between lava rocks with the ocean in the background or on the beach. 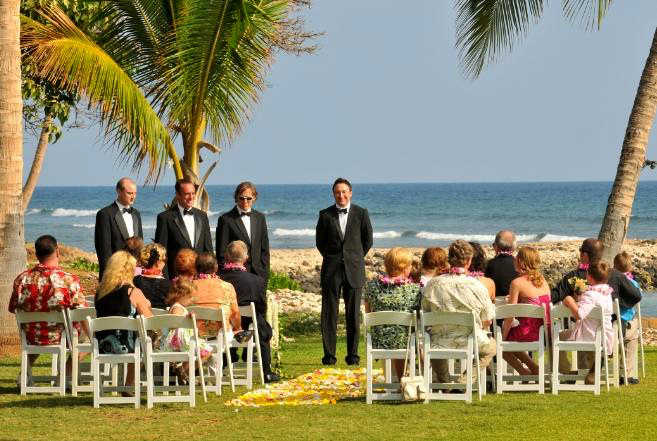 Since this spot is becoming popular for wedding ceremonies, we can not guarantee there will not be other people there, it could look like this. Due to State laws, we are limited to 10 guests at a wedding at this location. A permit is required. MAKENA SURF BEACH located in front of the Makena Surf condominiums in Makena. 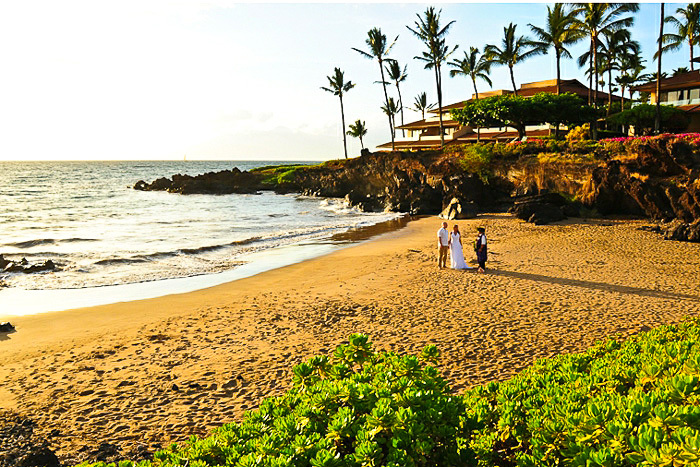 This big beach is the perfect spot for your off the beaten path wedding. Cement walkways take you through a tropical garden on your way to the beach through the resort past an ancient Hawaiian Heiau. This is a great location for small groups who want a more private location and a a great location for sunsets year round. The walkway is rather steep, if you have older guests you may consider another location. A permit is required. MAKENA SURF BEACH #2 and (Second Photo) and (Third Photo) and (Day Photo) called number 2 because there is no real name for this very small secluded beach. 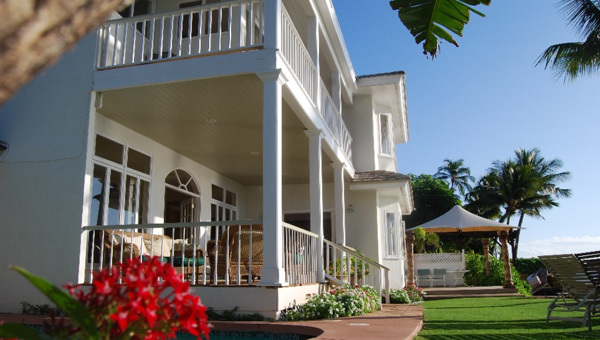 Located to the South side of the Makena Surf condominiums in Makena. 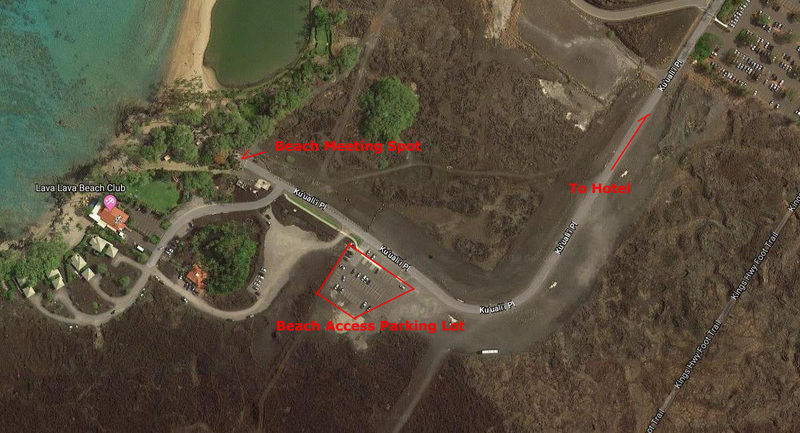 A small private parking lot for 4-5 cars is accessed through a gate on the South end of the Makena Surf property. A short paved pathway leads you to the smallish beach which is surrounded by lava rock. This is a very secluded location for small groups who want the most private location. This is a great location for sunsets year round. A permit is required. PALAUEA BEACH - " WHITE ROCK" (Second Photo) located in Wailea just South of the Kea Lani Hotel, Palauea Beach is a large white sand beach with 180 degree views of Kaho´olawe, Molokini and the West Maui Mountains. 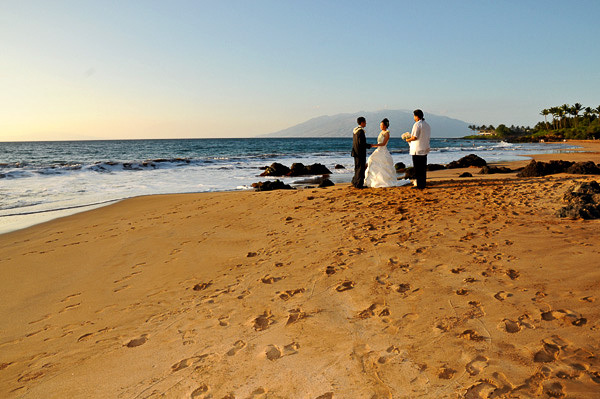 This location is perfect for couples who have over 10 guests and want to be married on the sand. 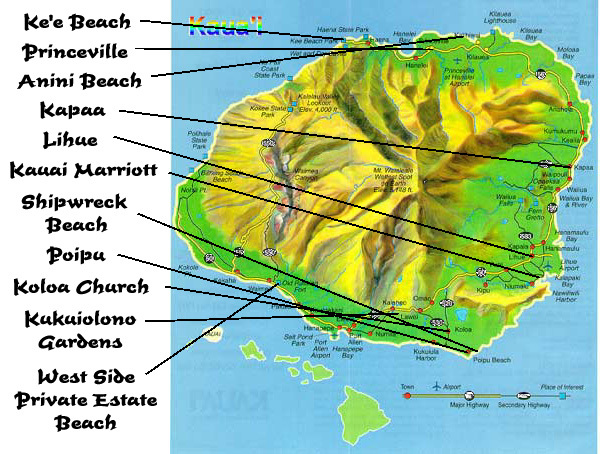 Since the beach is not by hotels and not listed on visitor maps, it affords a more private setting. This is a great location for sunsets year round. A permit is required. ULUA BEACH located in Wailea close by most of the Wailea Resorts. This is a beautiful beach popular with scuba divers and surfers. 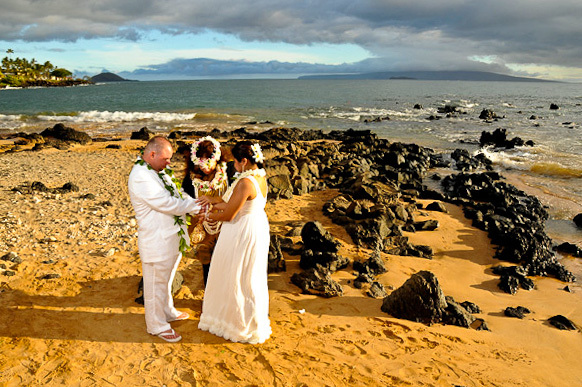 Weddings are performed either on the grassy hill with coconut trees and Haleakala, our 10,000 foot volcano, or the ocean in the background, on the white sand beach or rocky point which has a dramic 270 degree views of ocean and the West Maui mountains. A permit is required for the beach. WAILEA BEACH (Second Photo Grass) (Third Photo With Chairs) located at the beach parking area between the Grand Wailea Resort and the Four Seasons Resort. This Location is much like the Ulua Beach location but is less crowded. 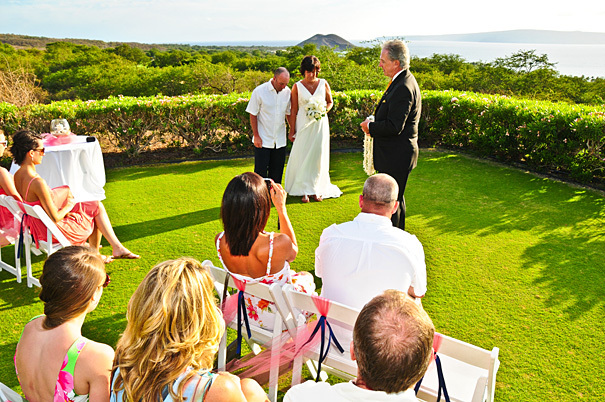 Weddings are performed on the grassy hill overlooking the large white sand beach with ocean and west Maui mountains as a background.This is a good location for from 2 to 20 guests. A permit is required for the beach. 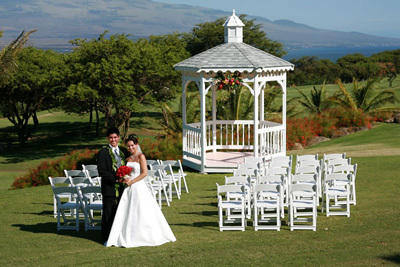 THE KAHILI GOLF COURSE - WAIKUPU The gazebo at the Kahili Golf Course is a perfect outdoor wedding ceremony site nestled in the West Maui Mountains and overlooks water features, majestic Cook Island Pines, and the green isthmus of Central Maui gently sloping to the sea. This site includes the use of the gazebo and chairs set up for up 20 guests for 2 hours. Maximum capacity 100. Call for pricing. 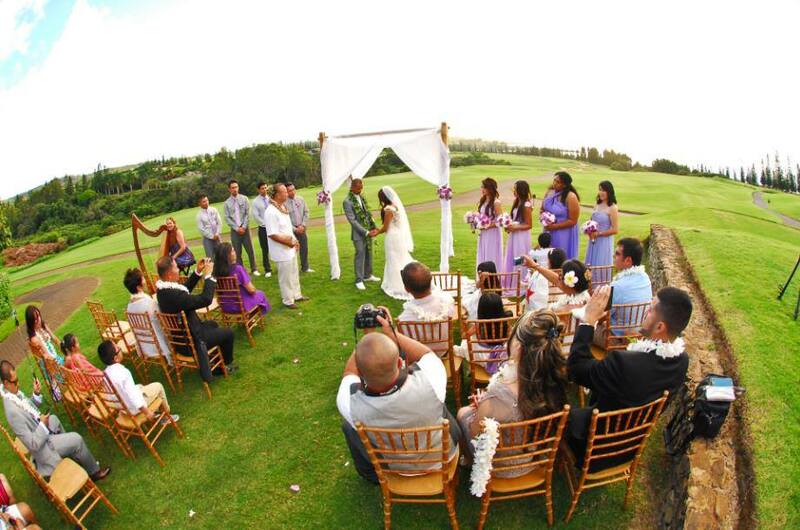 THE KAHALAWAI TERRACE AT THE KING KAMEHAMEHA GOLF COURSE - WAIKUPU (Second photo) Kahalawai Terrace is one of our most beloved outdoor ceremony locations. It features the most spectacular views, as far as the eye can see. You'll feel as though you're on top of the world. 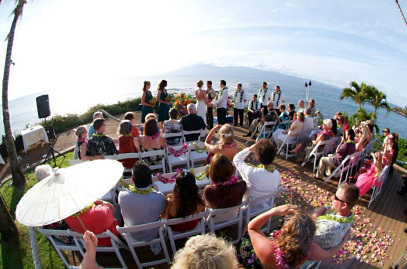 It's private setting, overlooking Haleakala and both the north and south shores, makes it the perfect place to join in matrimony. Capacity 150 Includes up to 40 White Padded Chairs. In Conjunction with Reception $750, Cermemony Only $975. 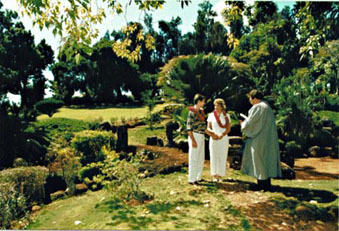 THE HOAPILI GARDENS AT THE KING KAMEHAMEHA GOLF COURSE - WAIKUPU (Second Photo) The Hoapili Gardens is our intimate ceremony location. The gardens are perfectly manicured with colorful tropical foliage surrounding the running waters. As the bride walks down the aisle, she crosses a bridge over the running stream. 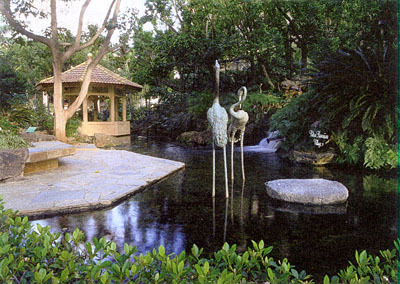 The nuptials are recited above a waterfall that flows into a koi pond. 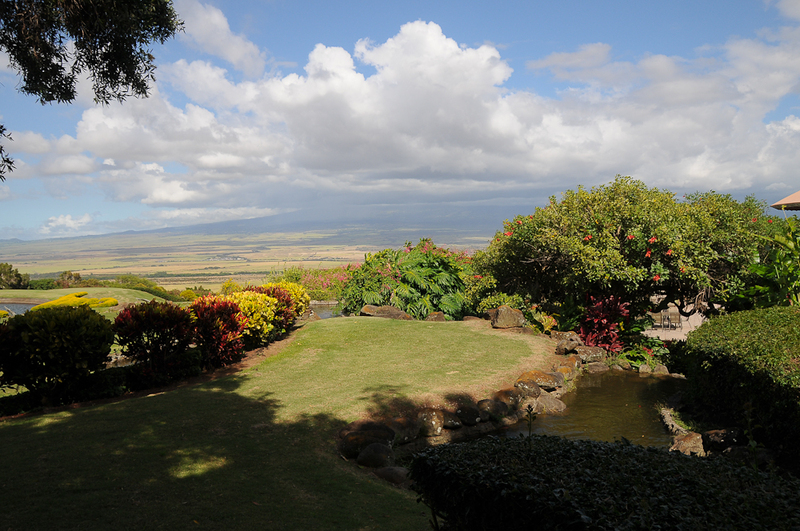 180 degrees of water, lush tropical foliage, and a view of Haleakala is what makes Hoapili Gardens the perfect tropical ceremony site. Capacity 12 Includes up to 12 White Padded Chairs, In Conjunction with Reception $350. Ceremony Only $500. MAUI TROPICAL PLANTATION the bustling Tropical Plantation is located in the Waikapu Valley in the heart of Maui, right off Hwy. 30. This is a working plantation with over 112 acres of planted fields, nursery, restaurant and market. A tram tour takes visitors through fields of sugar cane, pineapple, coffee, papaya, bananas, macadamia nuts and exotic tropical flowers. Weddings are performed in a quiet garden gazebo next to a beautiful small lake surrounded by tropical plants, coconut trees and manicured lawns. 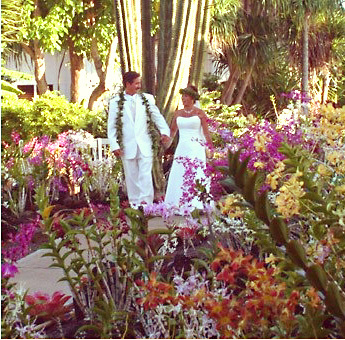 See our Plumeria Garden Wedding Package. THE OLOWALU PLANTATION HOUSE (Second photo) Centrally located in Maui at Olowalu, this sprawling private estate property is a fabulous spot to exchange your wedding vows and have a delicious catered reception. We can provide everything you need for an unforgettable wedding, from the minister, photography and flowers to the caterer, tents, tables & chairs and special touches like flower archways and tropical tiki torches. 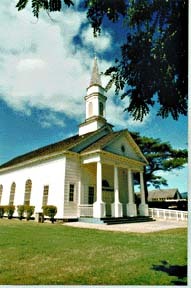 The Olowalu Plantation House is the right location for larger groups. Site fee $3400. 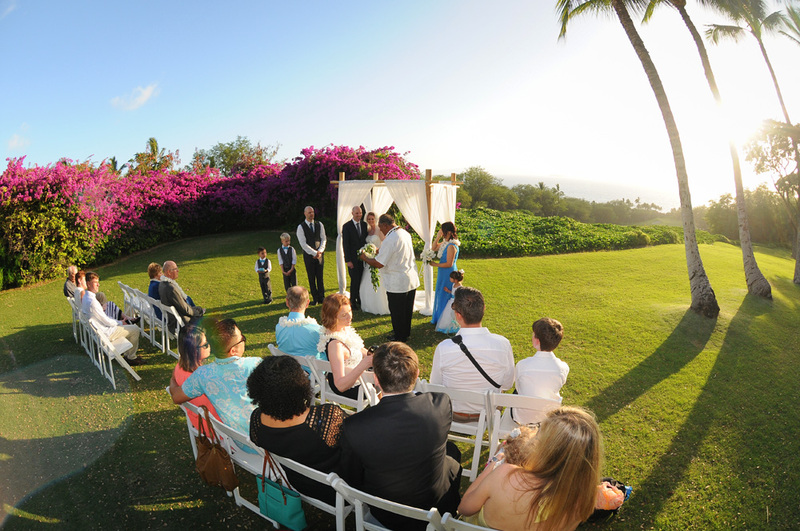 THE PLANTATION HOUSE located in Kapalua just 20 minutes north of Kaanapali; The Plantation House Restaurant is a very private wedding and reception site on the West side. 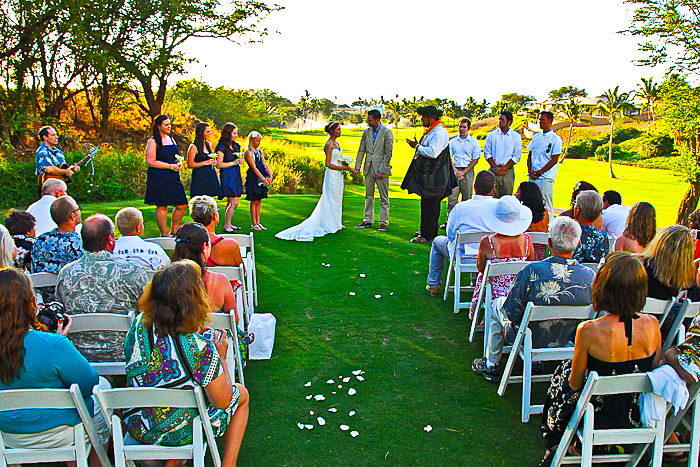 The wedding grounds are steps away from your reception room. 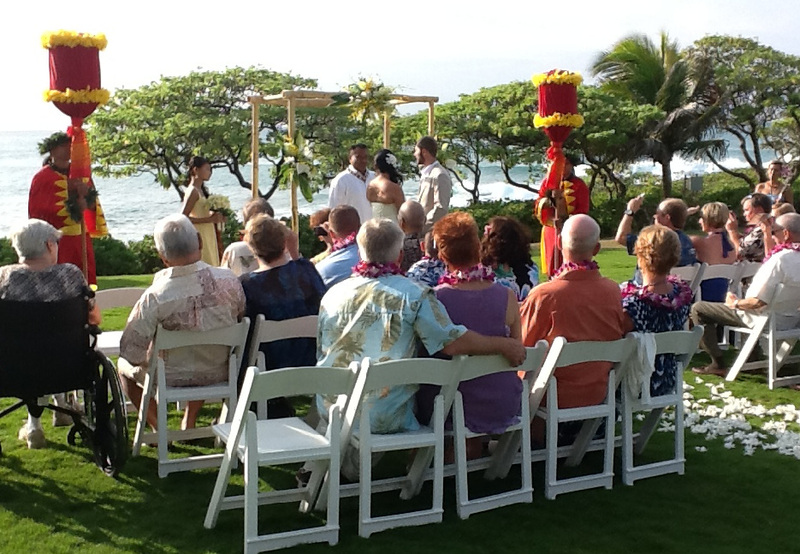 A bamboo arch with chiffon linen, and up to 90 wedding chairs are included in the wedding site fee. The property is available for up to 90 guests. 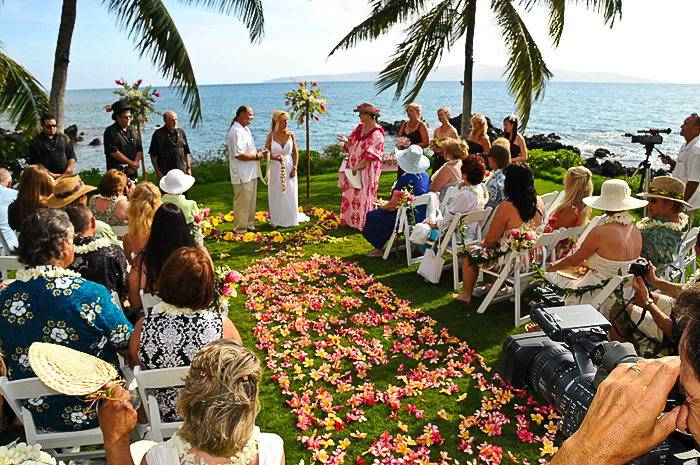 This is a popular location for larger groups who want a private ceremony in West Maui. Good for morning weddings or sunset.Add $25 travel time for each vendor for your wedding. Site fee $2521. IRONWOOD BEACH and (Second Photo) located 20 minutes north of Kaanapali; Ironwood Beach is a very secluded beach on the West side. It features fluffy white sand and is very dramatic with large waves most of the time. The beach has it´s own parking lot and rarely is there another wedding scheduled here. Although you can not see the sunset from this beach, the charm is it´s seclusion and raw forces of nature. 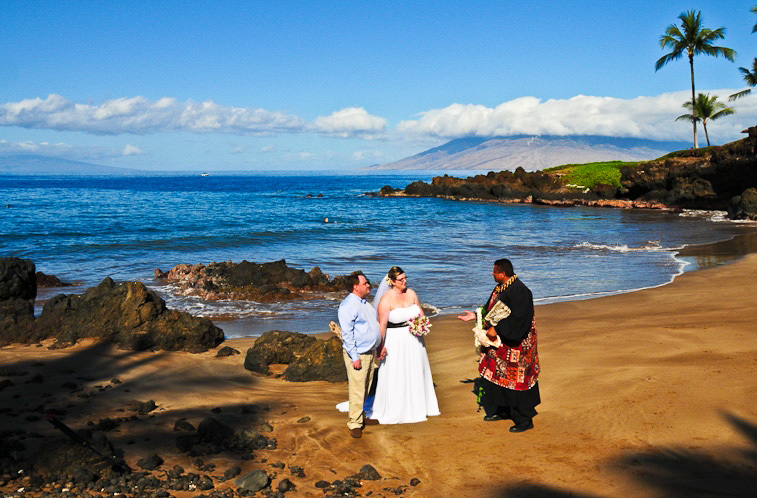 This is a popular location for larger groups who want a more private ceremony in West Maui. Good for morning weddings or sunset. Add $25 travel time for each vendor for your wedding. A permit is required. 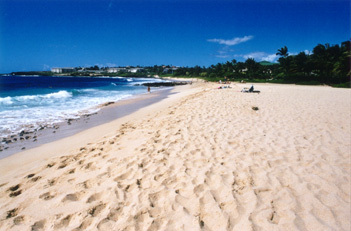 KAPALUA BAY BEACH and (Second Photo) located 15 minutes north of the resort area of Kaanapali; Kapalua Bay was voted the number one beach in America by Travel Age Magazine three years in a row. 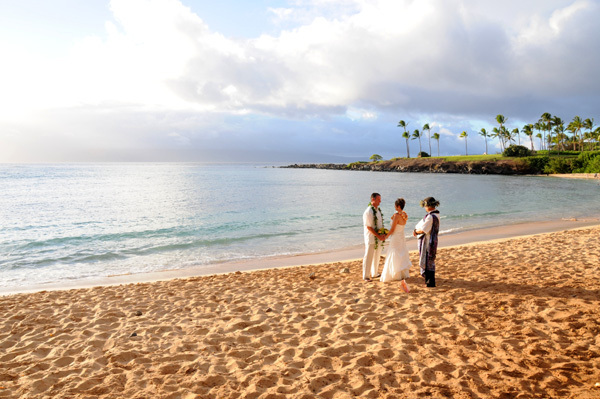 This beautiful white sand beach features views of Molokai, Lanai, a picturesque coconut tree covered peninsula in the background and adjacent coconut grove. 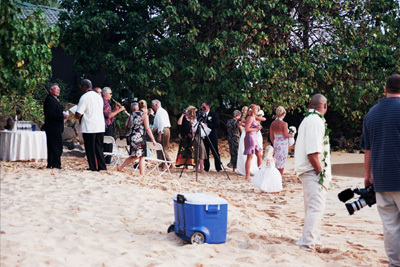 Weddings are performed on the beach at sunset only, after the many beach goers have left. 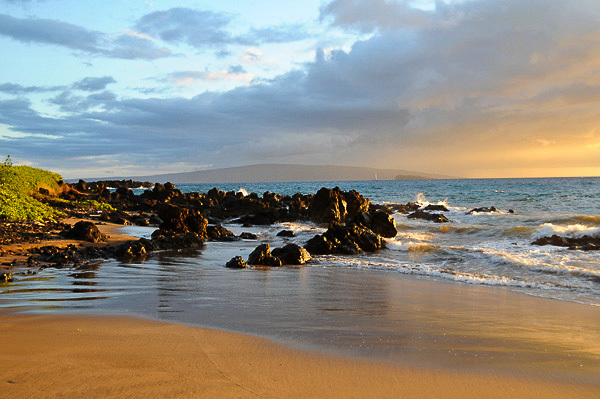 This is a great beach for sunsets year round as the sun sets behind the island of Lanai. Add $25 travel time for each vendor for your wedding. A permit is required. STATUE GARDENS - HYATT REGENCY RESORT Panoramic views of the blue Pacific and the palm-fringed Ka'anapali coast create the perfect backdrop for Statue Gardens. 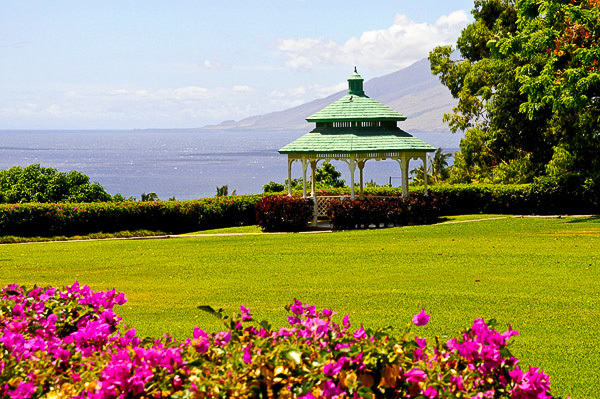 This grassy lawn is accented with blooming bougainvillea flora and plumeria trees. Ideal for wedding ceremonies and private receptions of up to 60 guests, the garden area also offers a romantic setting for a private, candlelit dinner for two under the stars. Accommodates 60-80 guests. Grounds fees $3500.00 (Price subject to change). LAHAINA GARDENS - HYATT REGENCY RESORT The most private location on the grounds of the Hyatt Regency is the Lahaina Gardens. 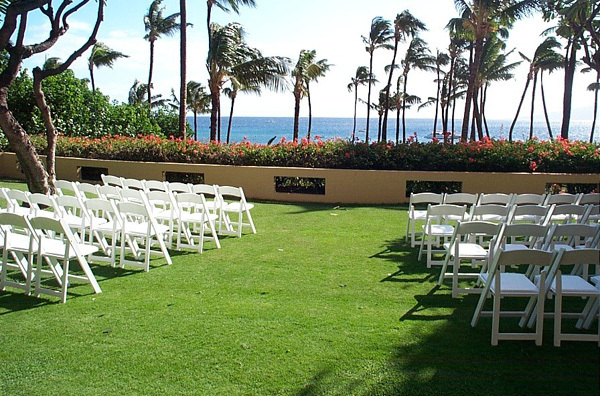 Off the beaten pathways of the hotel, hidden away from general sight, the Lahaina Gardens offers ocean views, room for up to 50 chairs and an archway. 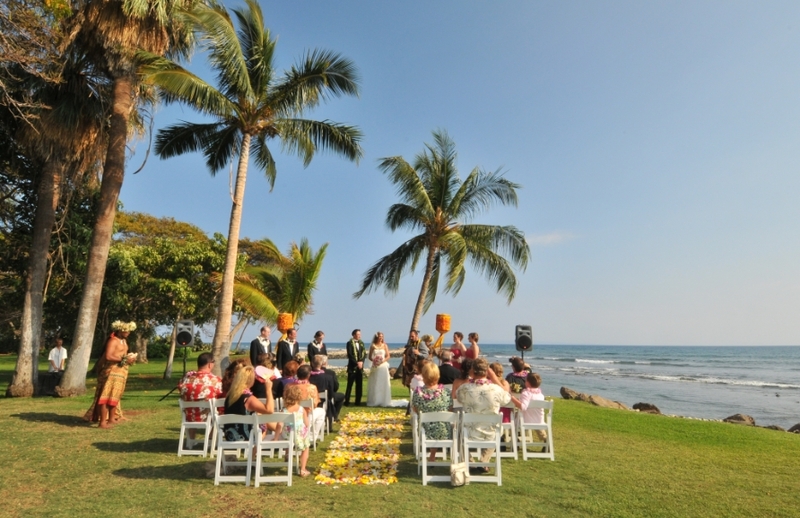 The wedding site is on flagstone and surrounded by tropical flowers and lush tropical foliage. Accommodates up to 40 guests. Grounds fees $3500.00 (Additional costs apply). Click on the Name of the Location, for an enlarged view. 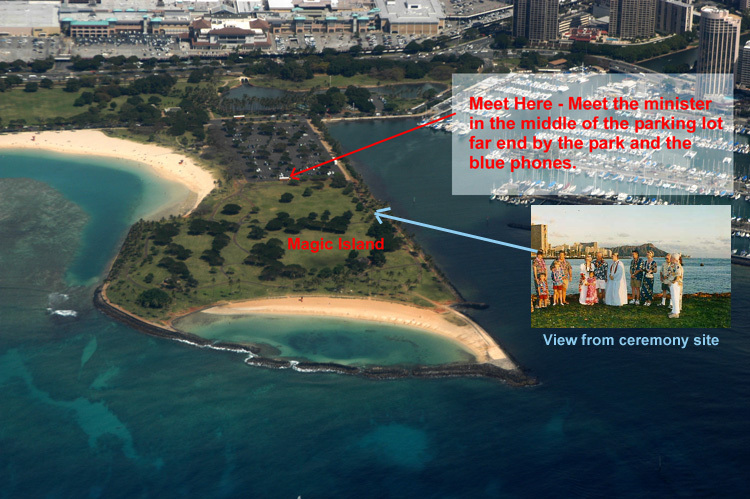 MAGIC ISLAND - ALA MOANA BEACH PARK (Second Photo) located just 15 minutes from all Waikiki hotels; this is the most popular location for our Waikiki weddings. 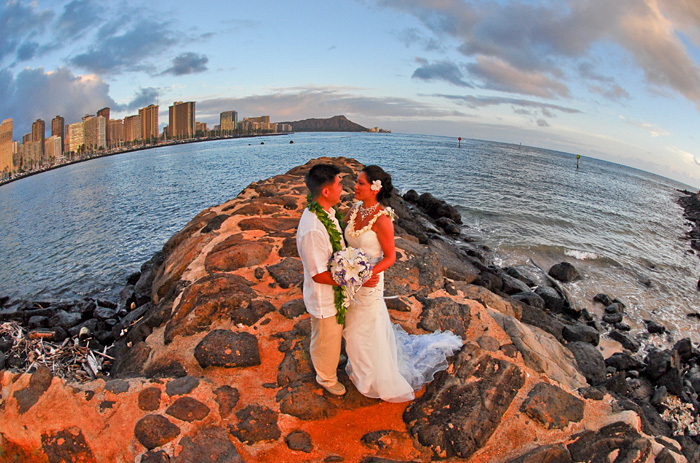 The world famous Diamond Head Volcano plus Waikiki will be in your romantic background. Ala Moana means "Path to the Sea" and this is the site of Honolulu's largest beach park as well as its huge Ala Moana Center. 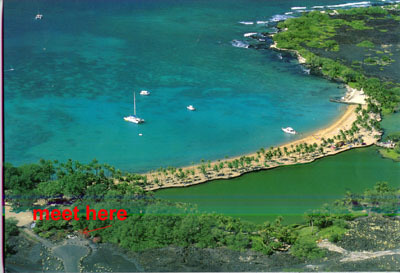 A 43 acre peninsula east of the park is known as Magic Island and borders Ala Wai Yacht Harbor. A permit is required. See map at Magic Island Map. HILTON HAWAIIAN VILLAGE WATERFALL GARDEN GAZEBO located at the Hilton Hawaiian Village Resort in Waikiki, Oahu. This beautiful spot features a lovely waterfall setting inside a garden and gazebo surrounded by a pond filled with colorful "good luck" carp. Feel free to add any additional services you wish. Hilton Hawaiian Village grounds fee varies. ROYAL HAWAIIAN HOTEL GARDEN WEDDING located at the historic Royal Hawaiian Hotel in Waikiki, Oahu. This quiet private garden setting is ideal for from 10 to 100 guests, or more. The hotel surrounds you in this lovely setting inside a garden. 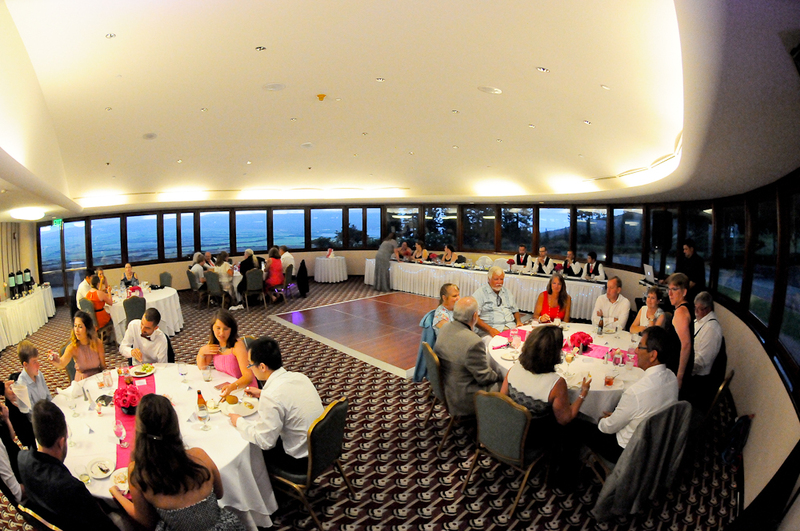 The Surf Room restaurant is a perfect ending to your wedding day with a variety of delicious selections to choose from. You may add any additional services you wish. Royal Hawaiian Hotel grounds fee varies. 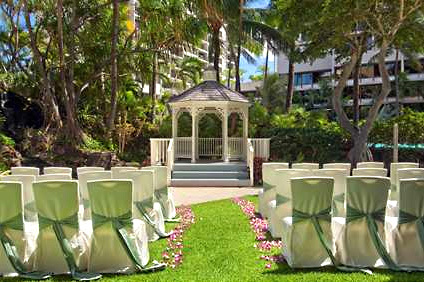 PRINCE KUHIO HOTEL GARDENS GAZEBO (Second Photo) located at the Hilton WaikikiPrince Kuhio Hotel in Waikiki. 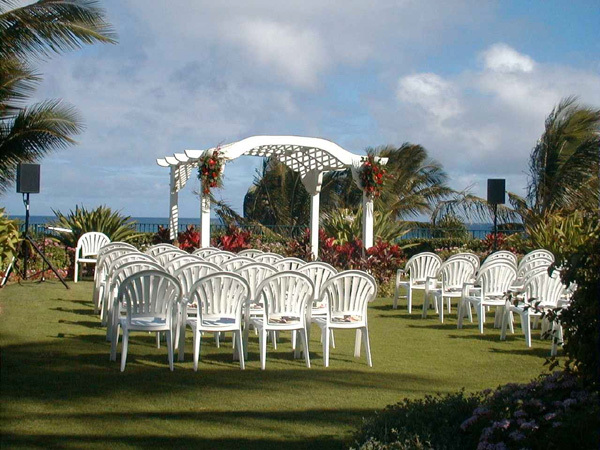 The beautiful picturesque gardens has a wedding gazebo where you can be married and will set up chairs for your guests. Although the location is not on the ocean, it's in the middle of Waikiki where you can pop out to the beach after the ceremony for sunset photos. Fees vary. PAPAILOA BEACH (Second Photo) Your wedding on Papailoa Beach on the famous North Shore of Oahu, is the most secluded spot for your intimate beach wedding. The beach is rarely visited by tourists and is not one of the surfing beaches that locals frequent. The beach offers beautiful sunset views and has some unique picture opportunities. NORTH SHORE BEACHES Normally we will indicate that you want your wedding on a North Shore Beach - To be determined. The determining factors will be worked out depending on a number of factors. We try to weigh the factors with the most likely location for a more secluded spot. 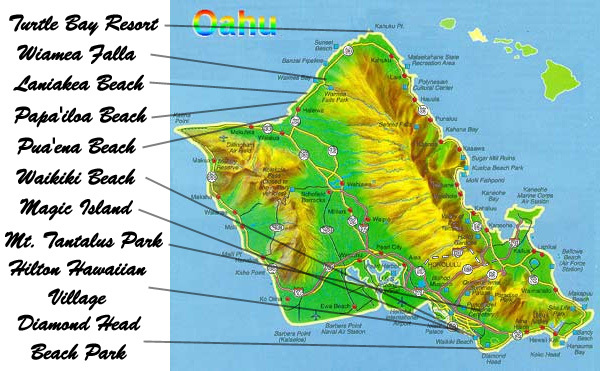 All the beaches in Hawaii are public, so there is always a possibility that there will be beach goers and surfers around. 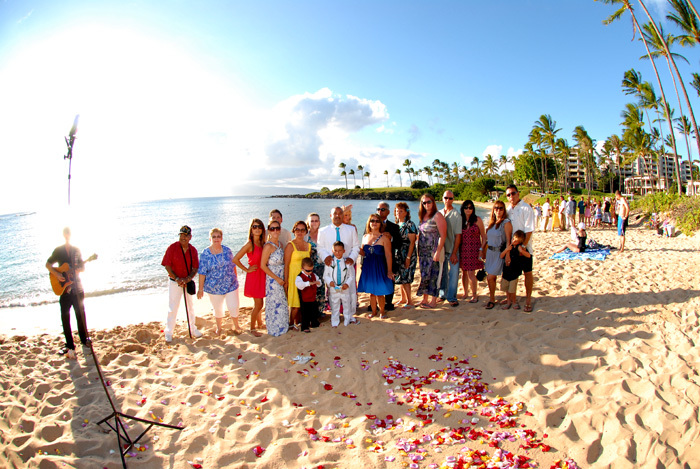 We try to perform your wedding as far away from beach goers as possible to provide a clean background for your photos. 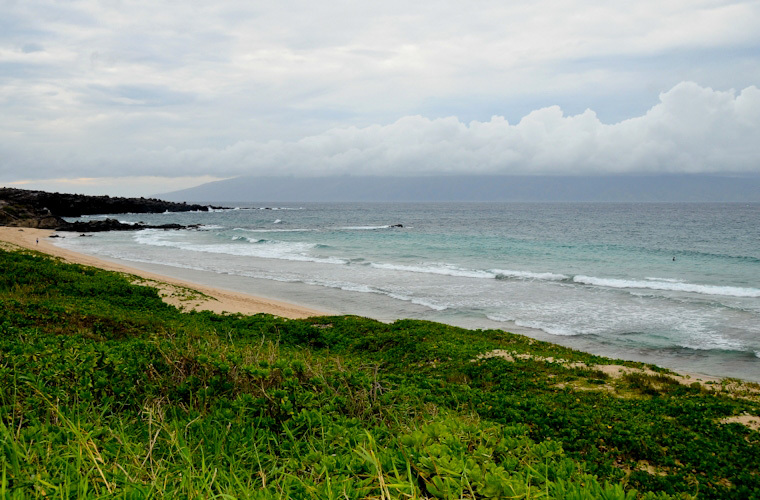 Our North Shore beaches include: Kawailoa Beach, A permit is required. Pua'ena Beach, A permit is required. 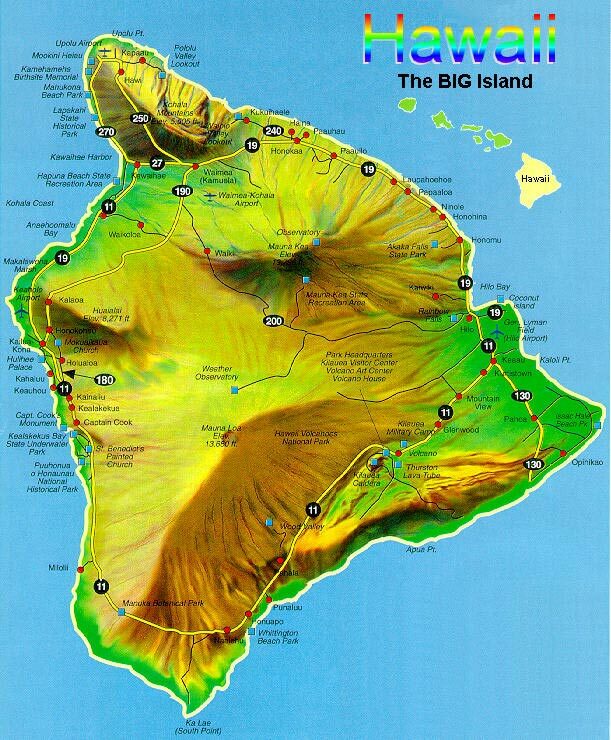 Ali'i Beach, A permit is required. Three tables Beach. A permit is required. Email us for descriptions and photos of these North Shore beach locations, and the factors involved in deciding which beach is best for you. WAIMEA FALLS PARK located on Kamehameha Hwy. five miles northeast of Haleiwa, Waimea Falls Park is one of the most popular locations for weddings in Oahu. With meadows surrounded by a blanket of crimson blossoms and thrushes calling from a nearby thicket, weddings are performed at the park everyday. Whether you wish to have your ceremony in the lush tropical gardens or with the waterfall as a background, you will surely appreciate this amazingly luxurious area. 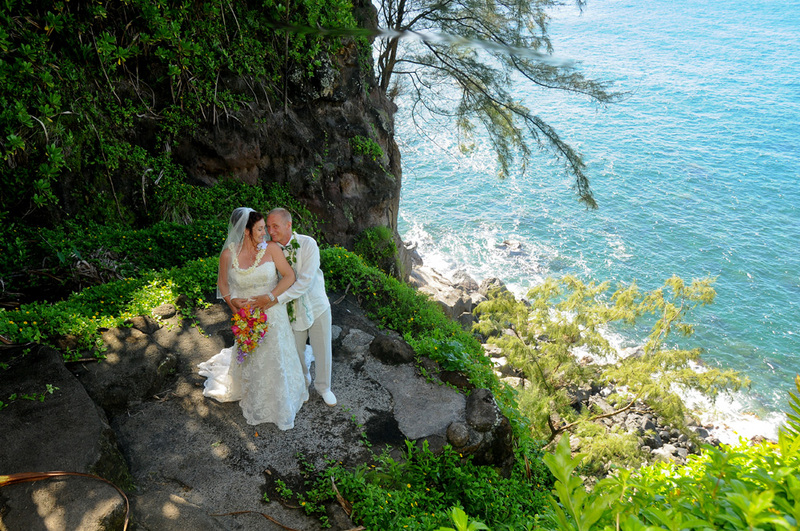 See our Waimea Falls Wedding Package. TURTLE BAY RESORT GLASS CHAPEL (Second Photo) located at the Turtle Bay Resort on Oahu's North Shore, this beautiful glass chapel affords 360 degree ocean views. Situated on a quiet side of the property and perched on a cliff top, this beautiful chapel seats over 60. If you like we can arrange standing flower baskets or other decorations for the chapel. 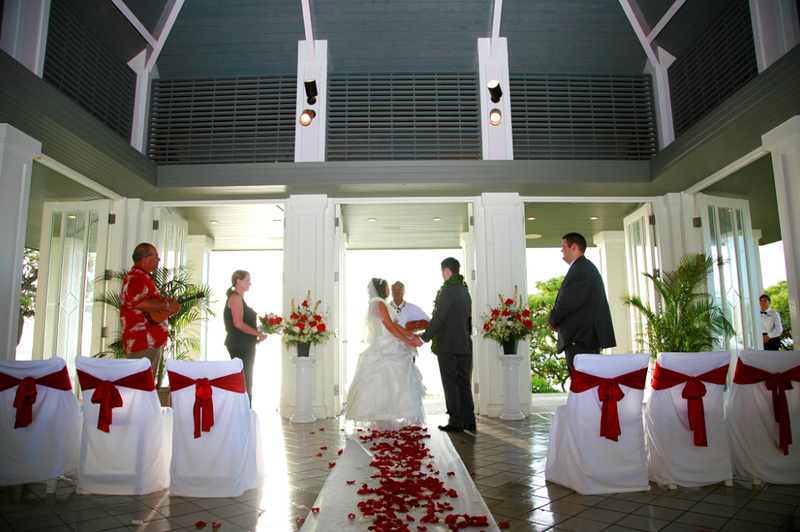 The newly renovated Turtle Bay Resort is not only a picturesque place for your wedding, but is also a great place to stay and will even arrange your lunch or dinner reception following your ceremony. Ask us for a complete buffet menu. 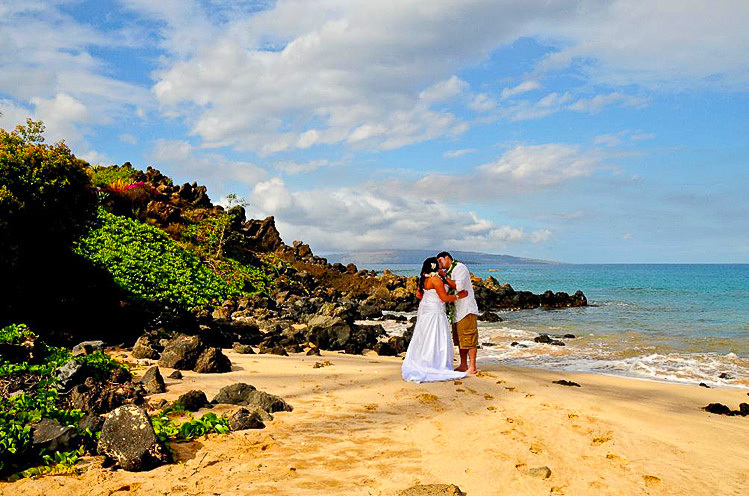 This is one of our newest locations for weddings in Oahu. See our Turtle Bay Glass Chapel Wedding Package. KUILIMA POINT - TURTLE BAY RESORT This private outside grassy area is jusr adjacent to the Turtle Bay Glass Chapel. If an indoor chapel wedding is not for you, consider the Kulima Point. With breathtaking 270 degree views of the Pacific, the kulima point location is great for groups from 2 to 50 or more. 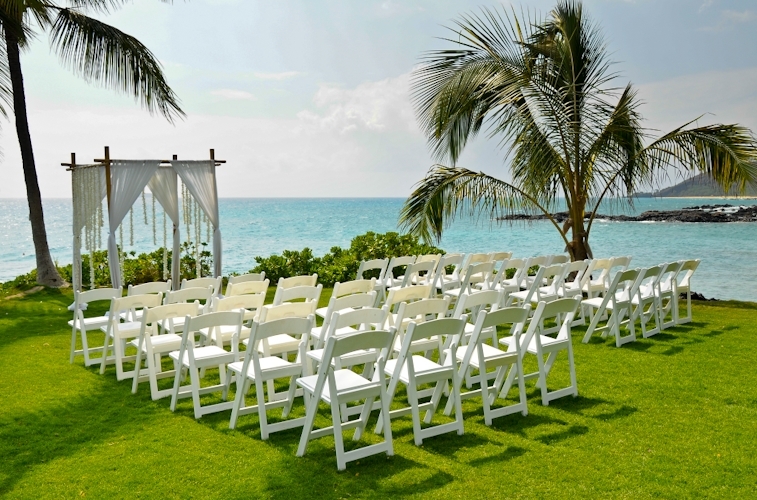 The resort will provide up to 30 chairs for your guests and you may have other wedding decoratons as well as an archway - which most couples add. This location also provides for an indoor rain alternative at no additional cost. 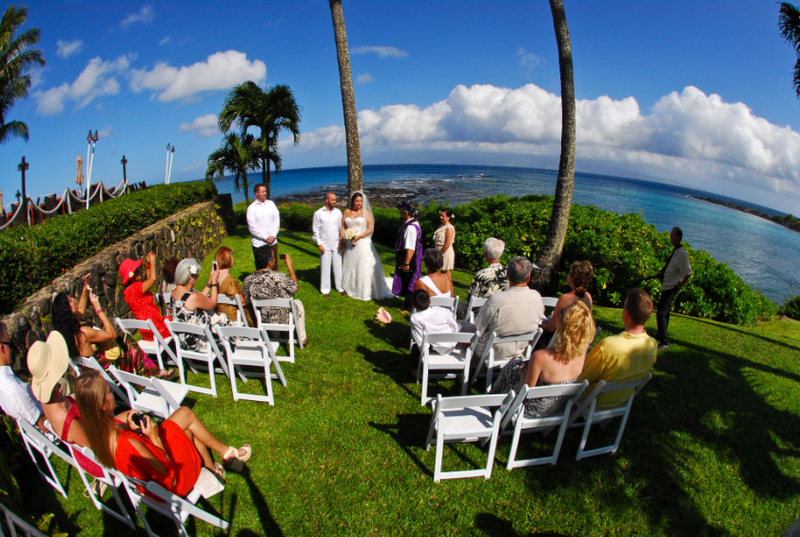 The site fee is included in our Turtle Bay Glass Chapel Wedding Package. SHIPWRECK BEACH located right in front of the Hyatt Regency Resort in Poipu; Shipwreck Beach is a beautiful large white sand beach excellent for wedding parties small or large. 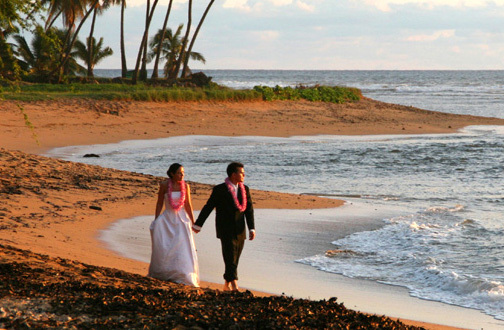 Although located on the South side of Kauai, this beach is good for late afternoon weddings. (The sun will set behind a mountain from this beach. If you want a true sunset location, see the WEST SIDE PRIVATE ESTATE BEACH location instead.) A permit is required. 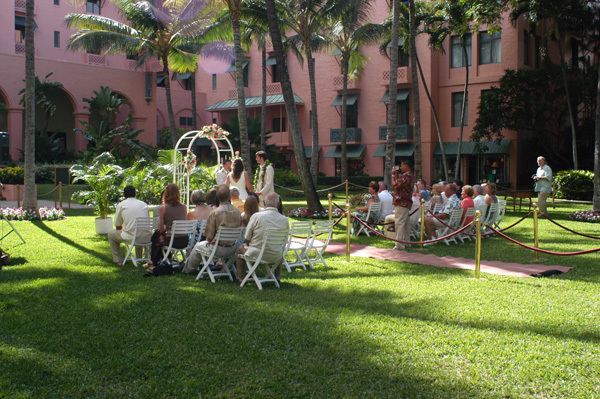 ORCHID GARDENS is the ideal location for your Kauai Wedding. Located in Poipu at the Kiahuna Plantation Resort, the award winning orchid gardens and tranquil koi ponds, and is just a few steps away from gorgeous white sand beaches. Invite your entire wedding party and guests to stay on property, exchange your wedding vows in the beautiful Orchid Gardens and throw an unforgettable reception at the adjacent Plantation style restaurant. 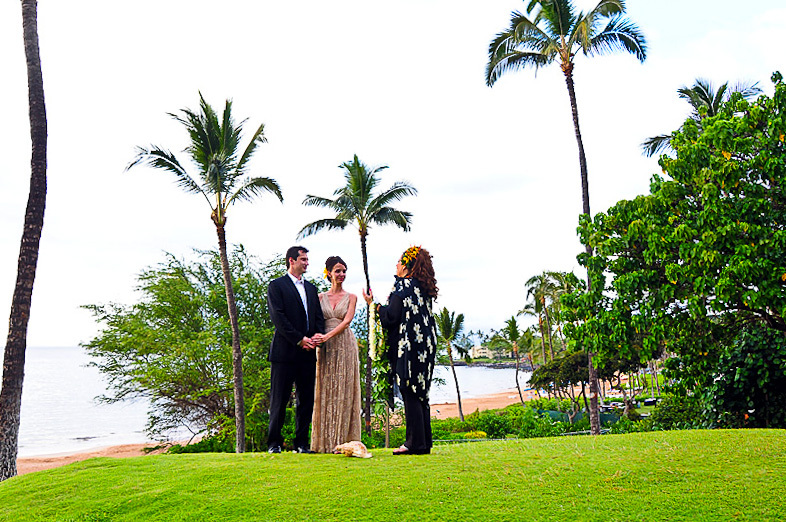 The Orchid Gardens is the perfect venue for a casual yet elegant Hawaii wedding. Grounds fee starts at $275 for small groups. KUKUIOLONO PARK located just north of Poipu off Hwy. 50, Kukuiolono Park is a large picturesque park which features a Japanese garden complete with a lava bridge, ornamental pool and beautiful florid landscaping. 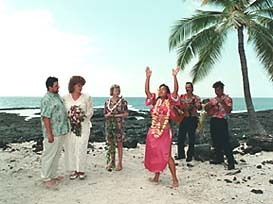 More like a tropical garden setting, weddings are performed by the lava bridge (which the bride crosses to greet her groom). 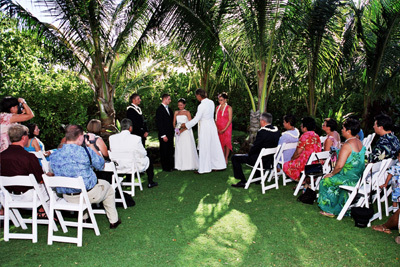 After the ceremony, photographs are taken in the lush tropical gardens which have narrow pathways leading through them. Garden fee for up to ten guests $250.00. 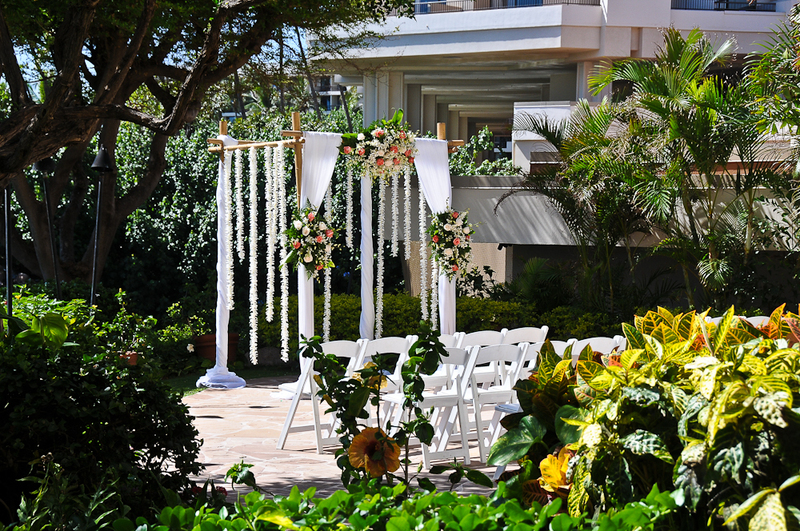 GRAND HYATT KAUAI Whether you wish to exchange vows barefoot on the beach or in the beautiful garden setting next to a cascading waterfall, the grounds at the Hyatt Regency Resort in Kauai is a perfect location. The resort gardens offer unlimited picture opportunities. 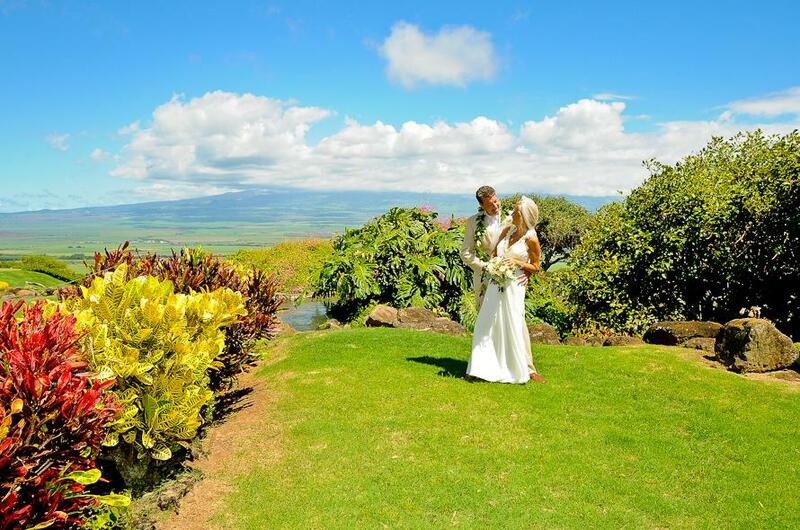 You can be married in the Keoneloa Garden by a beautiful pond or in Nohea Garden in their wedding gazebo which can be decorated with fresh flowers, or in the Wailele Garden where photographs can are taken by the 35 foot cascading waterfall. Grounds fees $3080.00. WEST SIDE PRIVATE ESTATE BEACH this beautiful private estate is only available to a select few wedding companies. 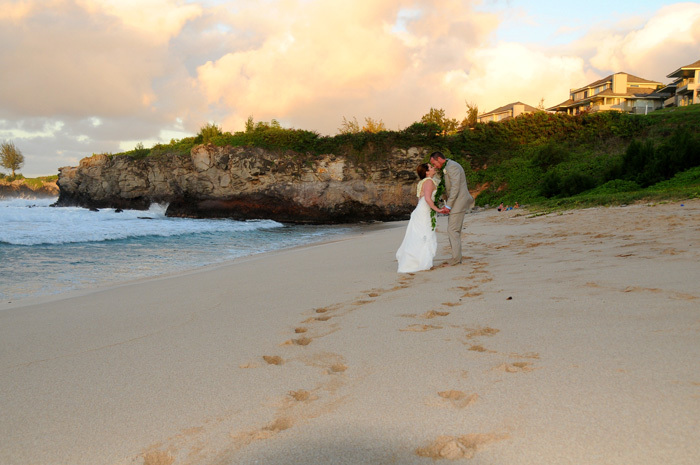 Located on its own beautiful white sand beach in Waimea this is the best possible location for sunset weddings. 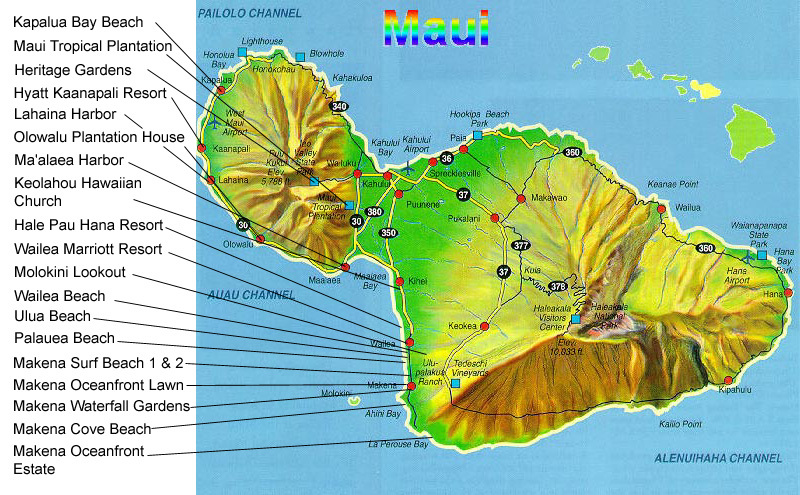 It is located approximately 45 minutes from Poipu and 1.5 hours from the Lihue area. 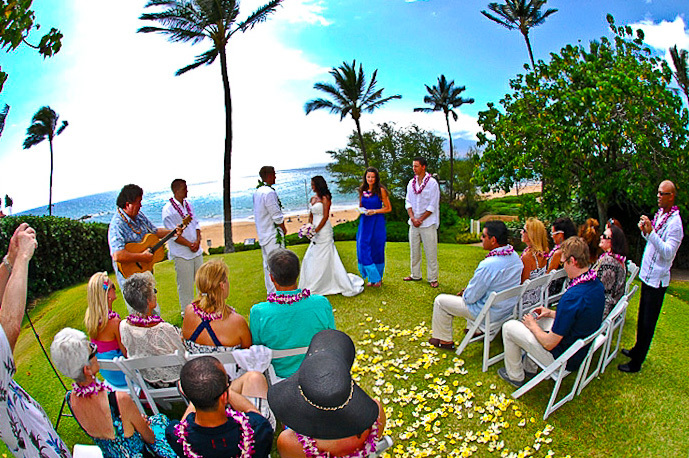 Ceremonies are performed on the quiet little beach or on the estate grounds. (Since the West Side Estate is very popular, we like to make these arrangements as far in advance as possible.) Estate fee Varies depending on guests, usually $500 or more. ANAEHOOMALU BEACH and ABAY PHOTO - ABAY PARKING is truly an enchanting area and is one of the most beautiful beaches. 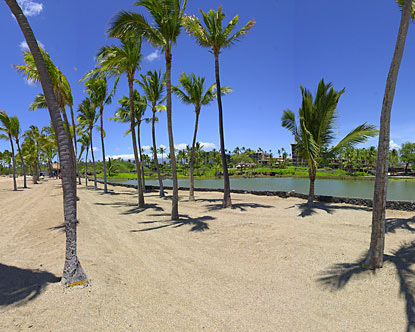 Located adjacent to the Royal Waikoloan Resort, the beach is close by all the Waikoloa Resorts and approximately 45 minutes north of Kailua/Kona. There are many coconut palm trees, a luxurious lagoon, and a long crescent of white sand. 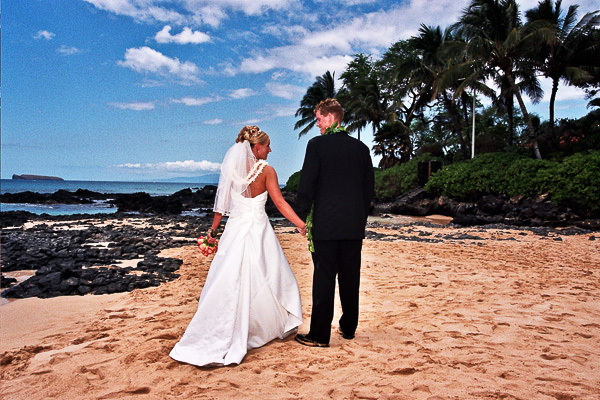 Anaehoomalu Beach is our most popular wedding site on the Big Island. Besides the beauty here, this location is one of the best for spectacular sunsets year round. A permit is required. PUUHONUA O HONAUNAU National Historical Park, also known as the Place of Sanctuary or Refuge, is located about 15 miles south of Kailua/Kona. This ancient holy ground was one of the few places to which refugees could flee for sanctuary. The beautiful beachfront park is filled with ancient heiaus and menacing wooden idols and is one of Hawaii´s most sacred spots. 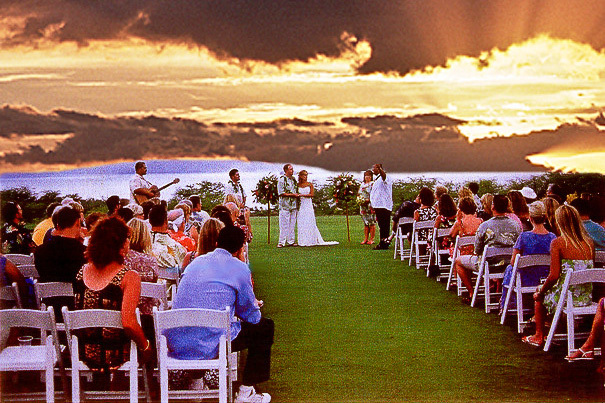 Weddings arranged here may take place at any time of the day and are especially beautiful at sunset. See our Place of Sanctuary Wedding Package. HULIHE´E PALACE Built in 1838 by Governor John Adams Kuakini, Hulihe´e Palace remained until 1916 a vacation spa for Hawaiian royalty. 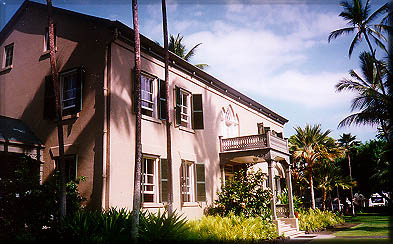 Situated on Ali'i Drive in the middle of Kailua-Kona, the historic two-story structure now a museum, displays a collection of former Hawaiian royalty furniture and effects, as well as ancient artifacts owned and maintained by the Daughters of Hawaii. This Palace was recently restored to the Kalakaua period. Majestically surrounded by an expanse of meticulously maintained grounds, you wedding takes place on the lawn with the ocean as a backdrop. Fee for a small wedding only between 10 AM and 3 PM $400.00, between 4 PM-6 PM $675.00.